After all the hype... after the endless stream of blogs and articles every woman, man and dog have found irresistible to conjure up (or just cribbed from whatever we've already published and passed off as their own, but who cares...), we're enraptured to publish the first Robotic Premier League Table of service providers delivering robotic-esque automation to their clients. And congratulations to Sutherland, TCS, HP, Capita and NorthgateArinso for making the early pace in this race for robotic royalty. 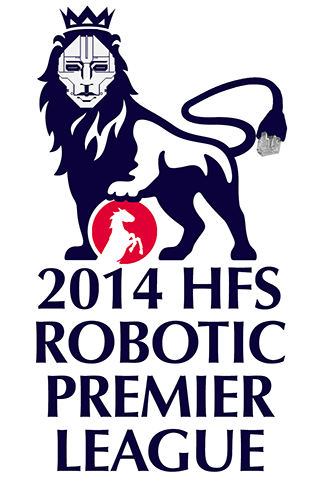 At HfS Research, we really enjoy our sport and so with the English Premier League season in its final throes and the Indian Premier League just starting, we thought it would be an excellent time to launch the Robotic Premier League of BPO Service Providers. While it is too early in the evolution of robotic process automation (RPA) to apply our comprehensive Blueprint Methodology to this market as sufficient reference clients don’t yet exist to feed into our execution criteria, we still wanted to provide our assessment of where the innovation in this market is coming from. 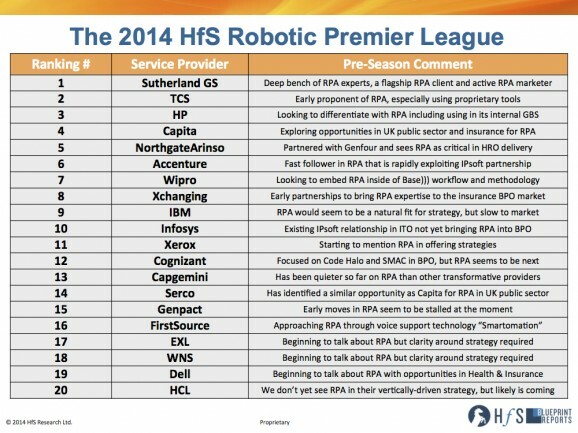 Having been the first analysts to start exploring RPA back in 2012, we have had the benefit of dozens of service provider and technology supplier briefings and have taken that insight and applied it to 5 major scoring criteria (using a 1-5 scale) to create an initial pre-season league table of BPO service providers in RPA. We also want to recognize emerging start-up specialist RPA solution provider UK based Genfour which is our current candidate for the mostly likely service provider to be promoted into the RPL over the coming year. As we said before, it’s still the “pre-season” for RPA in BPO and as we see the first client pilots turn into reference clients in the months ahead this initial league table will likely be turned upside down and around by service provider efforts. In the meantime, reflect on where your service provider(s) are in our rankings and watch to see how aggressive they are in moving up this table as the “real season” of client delivery for RPA begins. Did you also consider SaaS vendors such as ServiceNow, Salesforce.com, Zendesk, TeamSupport, Desk.com, etc., in this study? ServiceNow in particular maps well to the concept of process automation. Excellent insights into the emerging market. HFS is leading the way with covering new areas like RPA - well done! Interesting analysis - but surely the Indian suppliers are biting off their noses to spite their faces with robotics? @Brokelyn. Those services you mention are certainly part of the larger automation landscape. Many IT support functions and processes are being automated today even inside this list of 20 service providers using these tools. This league table was focused on how the broad BPO service providers are innovating around process automation today. @Dave. In many respects this is a real threat to the existing models of all suppliers (not just the Indian) but clients are looking for new approaches and breaking the REV/FTE dependency is a strategic requirement as well which is driving these efforts.